Qantas has operated its last Los Angeles-New York (JFK)-Los Angeles rotation with Boeing 747-400 equipment, with the US-tag flight now served with its 787-9 Dreamliners. The final 747-400 service to New York was on Friday August 31, with VH-OJT taking off from Los Angeles as QF11 a little after 0900 local time and landing at New York’s John F Kennedy Airport about five hours later. It spent about two hours on the ground before operating the reciprocal QF12 back to Los Angeles. The equipment change on the QF11/12 Los Angeles-New York (JFK)-Los Angeles rotation has resulted in a 35 per cent reduction in available seats on the route. Qantas has configured its 787-9s to carry 236 people, with 42 seats in business class in a 1-2-1 configuration offering direct aisle access for every passenger, 28 in premium economy laid out 2-3-2 across and 166 in economy in a 3-3-3 layout with 32in seat pitch and 17.2in seat width. By contrast, its 747-400s have 364 seats comprising 58 SkyBed II seats in business, 36 seats in premium economy and 270 in economy. The switch from the 747 to 787-9 to New York is one of several changes in Qantas’s North American network that took place over the weekend. The airline has commenced international operations with the 787-9 at Brisbane, where Qantas is basing four of the next generation Boeing widebodies. The 787-9 is flying daily between Brisbane and Los Angeles alongside three additional 747-400 services a week. The 747-400 will then disappear from the route completely from December 1, with the 787-9 to operate on Brisbane-Los Angeles 11 times a week. 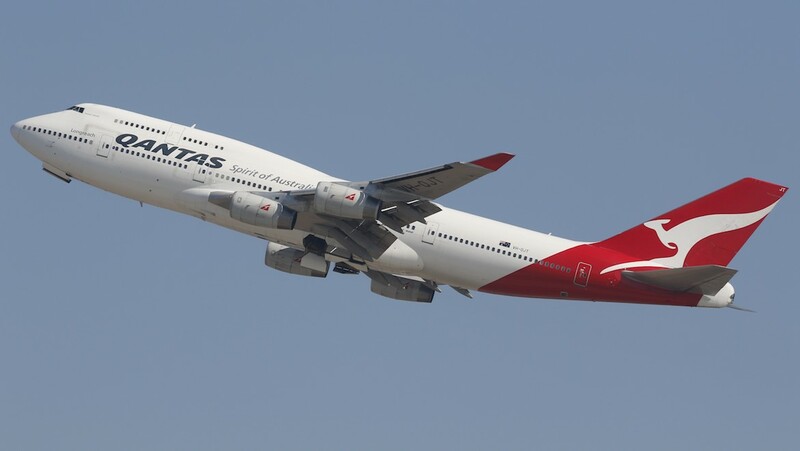 Qantas stated in May it planned to retire the last of its 10 747-400/400ERs by the end of 2020. 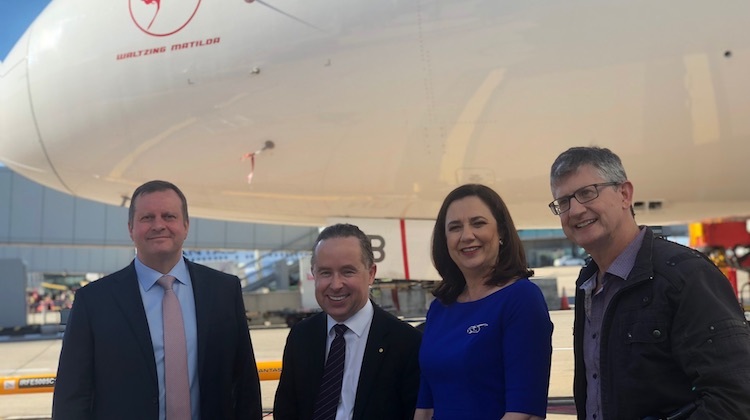 “We’ll have 120 cabin crew and pilots based in Brisbane to operate the Dreamliner flights and a further 350 indirect jobs are expected to be created as a result,” Qantas chief executive Alan Joyce said in a statement. Meanwhile, Qantas on Saturday also commenced four times weekly nonstop flights from Melbourne to San Francisco with 787-9s. 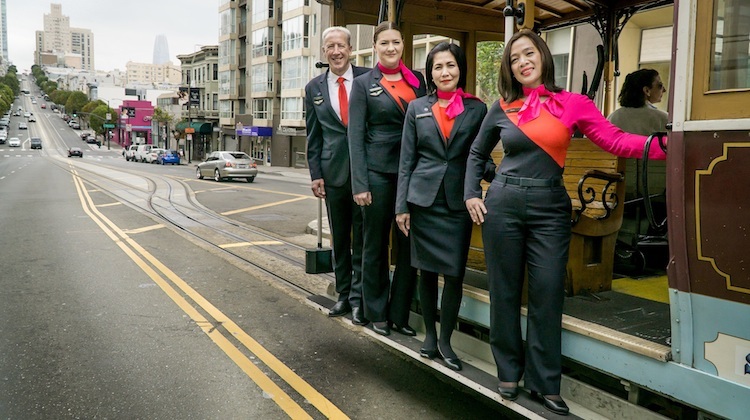 The new service, which was first announced in December 2017, operates on Wednesdays, Thursdays, Saturdays and Sundays as an evening departure from Melbourne and an overnight flight from San Francisco. Qantas is the only airline on the route. The start of Melbourne-San Francisco flights has also coincided with a rebalancing of Qantas’s capacity between Melbourne and the United States, with the six-times weekly QF95/96 Melbourne-Los Angeles rotation with the 787-9 trimmed back to two flights a week. “This will reduce travel times by at least two hours which means less time in the air and more time to explore or work in San Francisco,” Qantas international chief executive Alison Webster said in a statement. These new schedules have temporarily stuffed the MEL-PER-LON QF9/10 flights with delays and cancellations. Might be due to the late arrival of VH-ZNF but contingencies should have been in place. 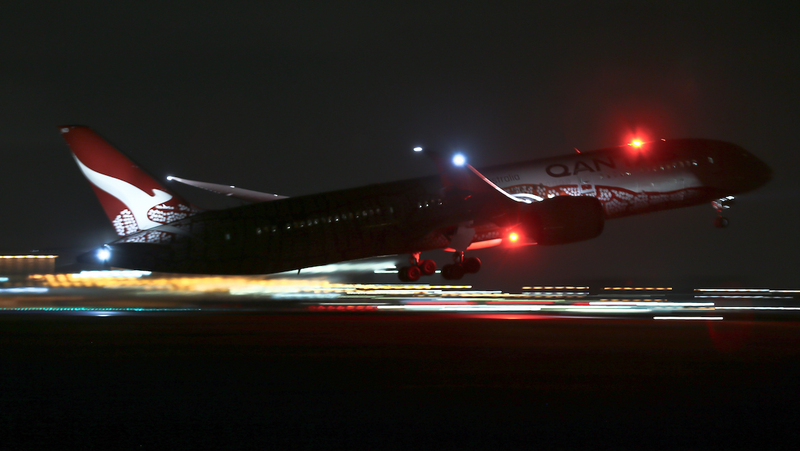 Took the QF16 LAX-BNE arriving yesterday on the 787 (Business Class). I must admit, I arrived far more fresher than previous journeys (although I will always love the Queen of the Sky) so maybe there is something in this new air pressure regime they are using. Service was patchy but overall good. Seat was excellent but bathrooms are as cramped as ever as opposed to the recent A350 journey HKG-Toronto where you could swing a dead cat! Flew the 747 over to New York from Brisbane on the 25th Aug. Both flights were full in the old rattler. Service was patchy at best particular Bne to LA. Very elderly staff on NY sector. Flying home on the Dreamliner this coming friday.